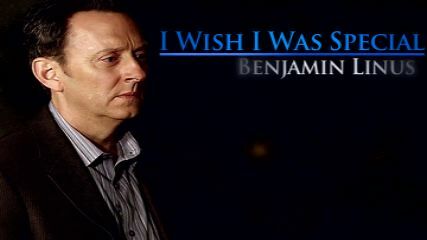 LOST Video Island - "Benjamin Linus-I Wish I Was Special"
Holy Christ, this was beautiful. I wanted to do a Ben character study, but I can't knowing it wouldn't be half as good as this. Wow, that was incredible. The song is PERFECT for Ben, although I heard it many times before and never thought of him. Each lyric was perfectly interpreted and the editing was perfect as usual. The end was especially chilling, with Ben left outside the church. And great use of the Alex flashbacks with the Ben's mom flashbacks. Powerful stuff! Btw, how did you get such clear definition? Did you make the clips from a Blu-Ray disc or something? Amazing! Also, I loved the part about "I want you to notice when I'm not around" with Ben's dad! Wonderful character study! Perfect song choice for Ben. I think you did a great job of making Ben a sympathetic character. I really liked the part around 3:07 paralleling young Ben and Ben running through the jungle. That was cool, I never caught that before. I thought your lyric use was great. I liked the lyric at the end about 'I don't belong here' with Ben sitting outside the church. That was a great Ben character study! Great character study, Dennis! Love the song choice. Very fitting for Ben's story and the stunning visuals of Lost. Well done you! 4 years now without Lost and it's really sad that there aren't as many videos being made anymore but I'll take the quality of the ones produced over quantity any day. This was so perfect, you showed Ben's struggle and made me feel all of the emotions again that I felt watching his story the first time round. Fantastic character study This song is perfect!! I really liked your lyric use, especially at the end with the "I don't belong here" with Ben sitting outside the church, as he didn't go inside and move on with the others Great work!